Glass Art editor Shawn Waggoner shares the current concerns of U.S. art glass manufacturers who are faced with large amounts of capital investment due to regulatory changes in the industry. Readers are encouraged to contact their senators and representatives to inform them of the risk to this unique American manufacturing specialty. Barbara Krueger, Michigan’s historic preservationist, stained glass artist, and American Glass Guild (AGG) founding member, was recognized at the AGG Conference as the recipient of the 2016 Joseph Barnes Lifetime Achievement Award. Krueger joins past winners including Peter McGrain, Rowan LeCompte, Jack Cushen, Sylvia Nicholas, and Nicholas Parrendo. Troy Moody’s 28-foot architectural curtain, Veiled Aesthetic, is made of kiln formed art glass, large format dichroic glass, and mixed media. This temporary public art installation, which speaks to the artist’s expanding aesthetic and technical repertoire, elaborates on the autonomous art glass assemblage pieces he has been exploring for years. As artists gain more experience and exposure, opportunities to apply to more juried shows will present themselves. When deciding which shows to enter, it’s important to look at how an artist’s work matches each exhibition as well as what the show provides to the artist, including prestige and an introduction to a market for work. Of all the potential glass paints available to artists, silver stain is by far the most finicky to work with. Because it involves a controlled chemical reaction, it is critical that all of the variables associated with its preparation, application, and firing are carefully managed by the artist. The 15th Annual Mosaic Arts International (MAI) exhibition series, sponsored by the Society of American Mosaic Artists (SAMA), is a creative, innovative, and diverse collection that offers a unique and compelling view of mosaic art in the 21st century. Each of the works exhibited speaks an ancient language with a contemporary translation. Craig Mitchell Smith was originally a painter, theatrical set designer, home restorer, a flower arranger, followed a random road into fused glassmaking that has been successful beyond his wildest imaginings. He is entirely self-taught in glass and believes that his eclectic background and skills with stagecraft inspire how he thinks about glass. Glass . . . Paint . . . Swing! Oil painter Bonnie Owen, glass artist Leslie Perlis, keyboardist Sue Palmer, and dance instructor Jannette Kutchins recently joined forces to produce a unique event and experiment for their community. This fun, memorable reception combined a mixed media exhibition with the chance for attendees to be introduced to swing dancing. The Contemporary Glass Society (CGS) was invited to show members’ work at the Etienne Gallery in Oisterwijk, The Netherlands. 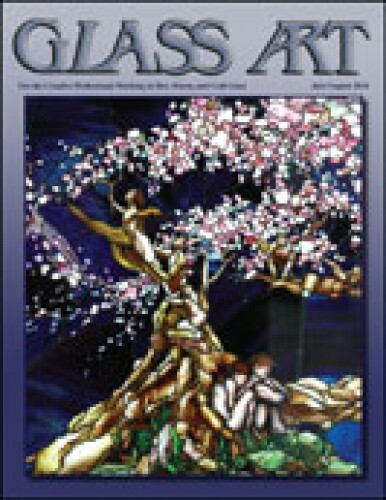 The work in this show reflected the diversity of techniques and forms used by outstanding glassmakers working in the United Kingdom from pâte de verre and blown glass to casting and lampworking. The altruistic influence of his family inspired Benjamin Belgrad to turn his glass art into a philanthropic pursuit. Through the Big D.R.M.S. Project, he sells glass cups handcrafted in collaboration with other artists and produces and sells a solo line of whiskey glasses, from which 15 percent of the proceeds are donated to charity.